Want to learn how your organization can better advance women and promote diversity? Come learn from the experts! The Cutting Edge Conference convenes professionals from diverse fields - law, business, tech and others - to engage in a creative dialogue around a shared commitment to gender equity and diversity. At this conference for top-level professionals, leading scholars will discuss the latest research relating to women’s advancement and provide tools for achieving meaningful organizational change. Conference attendees will actively engage with business leaders pioneering innovative best practices, scholars doing path-breaking research, and other conference participants. Participants will learn about innovative strategies for improving diversity outcomes and leave with tools to help their organizations better retain, support and advance women. This conference is part of the Women’s Leadership Edge membership program, but non-members are welcome to attend. Click here to learn about Women’s Leadership Edge and membership benefits. Interested in learning more? Contact us at cec@worklifelaw.org. Other professionals committed to gender and diversity issues. The Cutting Edge Conference is highly celebrated and hosts 100+ participants from Fortune 500 firms and companies each year. “I go to a million conferences, and this is hands-down the most useful, practical conference I’ve attended." Supporting Members receive two (2) free tickets to the conference, and Sponsoring Members receive four (4) free tickets. Members can purchase additional tickets at a discounted rate. Bring a guest to the conference! Member discount applies to all tickets purchased by members, including tickets purchased for clients and others outside of member’s organization. If your organization isn’t a Women’s Leadership Edge member, don’t worry! Non-members are welcome (and encouraged!) to attend. The Cutting Edge Conference is the only feature of the Women’s Leadership Edge program that’s available to non-members, so it’s a great opportunity to check out our programming. What distinguishes the Cutting Edge Conference from other women’s leadership programs? How many people will attend the Cutting Edge Conference? The conference is an exclusive, invitation-only event, limited to around 100 participants. We strictly limit the number of participants to ensure a highly-interactive program with ample opportunities for one-on-one coaching and valuable network-building between participants. What is appropriate conference attire? Any recommended hotels? What about transportation? A list of nearby hotels can be found here. We’ve reserved a block of rooms at the W Hotel available to Cutting Edge Conference participants at the discounted rate of $289/night plus tax. Rooms at the W are very limited and we encourage participants to stay wherever they are most comfortable. A list of nearby hotels can be found here. If you’re attending the conference from out of town, we advise against renting a car. Parking in San Francisco is both expensive and difficult, and we’ve tried to insure that both recommended hotels and conference venues are close together and public transportation. If you choose to drive, parking information for the area around UC Hastings can be found here. What about cancellations and participant substitutions? All cancellation and participant substitution requests must be made in writing and sent via email to crowleych@uchastings.edu. Participant substitutions may be made at any time at the election of the organization. Full refunds are available for all registrants if cancelled before October 1, 2017. There are NO REFUNDS for cancellations on or after October 1, 2017. Registrants that cancel on or after October 1, 2017 will receive a credit for the amount paid for the cancelled participant and can use that credit toward the 2018 Cutting Edge Conference. Any unused credits will expire on January 1, 2019. How will this program benefit my organization? Women represent a vital talent pool for companies. Organizations benefit when women apply their talents as leaders, serve as mentors and role models crucial for attracting and retaining junior women in the organization, and provide the diversity that the marketplace increasingly demands. The Cutting Edge Conference provides the latest research and innovative, practical strategies and tools to help your organization better retain, support, and advance women and diverse talent from within. How will individual participants benefit from the program? In addition to helping your organization meet its women’s leadership goals and effectively support diverse talent, the conference also provides valuable training for individual attendees by preparing participants to assume greater leadership responsibilities, increase their value to and their visibility within their organization by elevating the status of women’s/diversity initiatives, and leverage their abilities and talents more strategically for positive business results. Is the conference designed primarily for individuals in law firms and corporate legal roles? No. The conference programming is designed for women and men in both law firms and corporations, including non-legal roles and departments. Can men participate in the Cutting Edge Conference? Yes! We strongly encourage men to fully participate in the conference. The content is ideal for men who are sponsors, mentors, professional development directors, and organizational leaders who want to learn how to better support, retain, and advance women. Can non-members attend the Cutting Edge Conference? Yes. Although the Cutting Edge Conference is part of the Women’s Leadership Edge program, non-members can also purchase tickets. And if your organization might be interested in joining Women’s Leadership Edge, the conference provides a great opportunity to learn more. Interested in supporting women’s leadership? 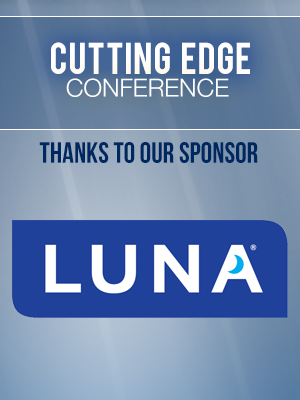 Sponsor the Cutting Edge Conference! There are two levels of sponsorship – lead program sponsor ($10K) and supporting sponsor ($5K). Space to display sponsor'ssignage and promotional materials at buffet, reception, and lecture areas that will be visible throughout program. To learn more, contact Chelsey Crowley at crowleych@uchastings.edu.